DZ's Adventures: Prey Drive - You can work through it. Guess who loves her kitten!! It can be done! Ziva is the perfect example of that. Prey drive tends to be very high in bully breeds, the terrier in them wants to hunt. Ziva came to us with a low prey drive, if our cats held their ground then she wouldn't chase them but she would whine, pace, and focus. This low end prey drive if ignored could easily have turned into a high prey drive resulting in killing smaller animals. Dogs are hunters, and although they are domesticated certain breeds have stronger hunting tendencies and prey drives than others. Dangerous animals - We do lots of hiking, I do not want my dogs going after a rattlesnake that can in turn injure/kill them. Their are other animals that can hurt your dog too: raccoon's (have been known to kill dogs), skunks, possums, chance of a rabid animal or other nasty disease. Vehicles - You do not want your dog to chase a small animal into the street and potentially be hit by a moving vehicle. Laws - If your dog kills a neighbors cat or small animal, dog, etc..then you can face fines, potentially jail time (depending on your local laws), and your dog may face euthanasia, imprisonment within a kennel, mandatory muzzling and could be labeled a "dangerous dog" for life. Before you can work on prey drive you must first be the established leader in your pack, your dog must also follow basic commands such as sit and stay. A good relationship with your dog is always stronger than a tool. Prey drive is not the same thing as aggression - it is a hunting instinct driven by scent and sight (in some dogs). When a dog becomes focused on their trigger, be it a cat or squirrel, no amount of yelling will break their concentration. What you also do not want to do is cause your dog to fear you by yelling, screaming, or becoming angry with them for their natural instincts. As the pack leader we extend our protection to the smaller animals in the house. Regardless of how Ziva feels around them she must respect them. In order to teach her to respect the cats we would give Ziva a firm "NO" whenever she began to focus or whine towards our cats, and then redirect her attention to something more interesting like food or playing with us. If she continued to whine and/or focus we would send her to her crate for some quiet time, or remove her from the room and ask her to calm down before being allowed to rejoin us. Remember - focusing, and whining are not allowed. 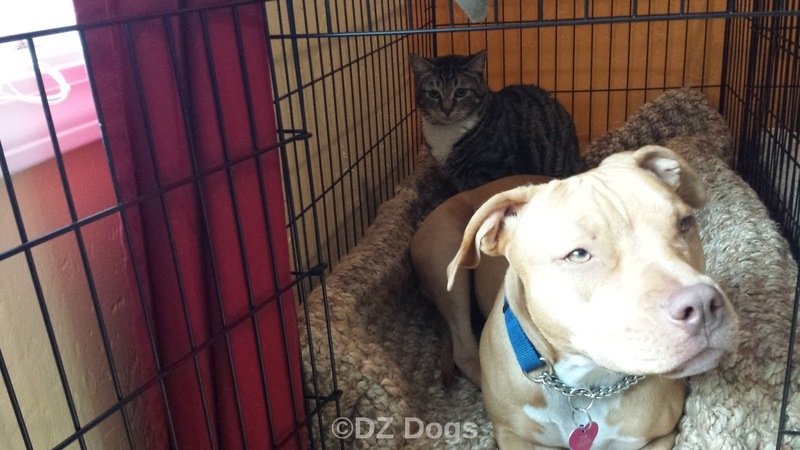 Ziva could only be around the cats if she was calm and preferably ignoring them. Merlot and Belle aren't stupid, they knew to avoid Ziva when we first got her. This is another reason to crate train your dog, for the protection of the non-dog members of your family when you are not around to supervise. Merlot helping daddy file Ziva's nails, Dante along for emotional support. Working with Ziva regularly we were able to overtime teach her to ignore our cats (but we're still working on neighbor cats, squirrels, and birds)... But then along came the kitten. - click here for the full story. Being so small and helpless the kitten seemed to re-trigger Ziva's prey drive. On a good note - since we have already laid a lot of ground work through correcting Ziva when she exhibits hunting behaviors we have been able to fairly quickly get Ziva to not view the kitten as a snack and now they are best buddies! When working with a dog who has prey drive issues you must first have yourself established as the calm and assertive pack leader, your dog must trust and respect you. Now please don't get me wrong...when some people hear the words "pack leader" they think things like dominance, and alpha rolling. By Pack Leader, I simply mean you are the one in charge just like a parent is in charge of a child. It is your house, your rules, you maintain balance and order through love and boundaries. 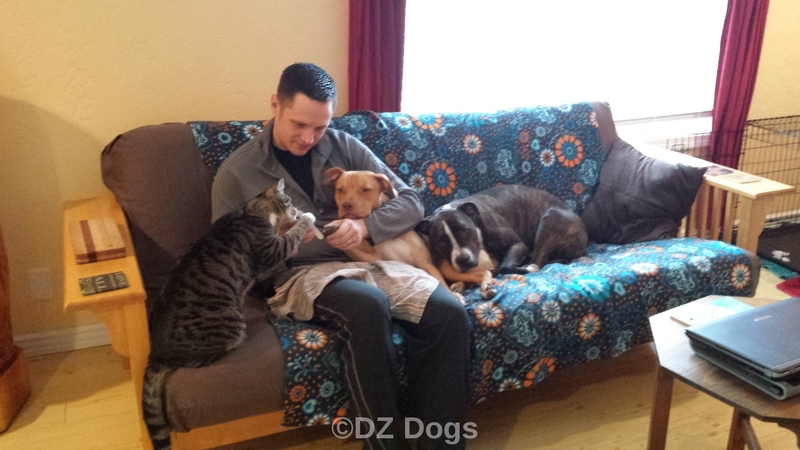 While working through Ziva's prey drive initially our goal was to teach her to ignore our cats. Merlot loves stealing Ziva's bed in her crate! When we are out on walks - we still expect Ziva to ignore small animals, birds, and cats. While walking if she begins focusing on an animal we stop, and wait. If she refuses to break concentration we backtrack until we find her "threshold" and continue waiting for her to return her attention back to us. Sometimes we use "look at me" commands and treats/toys to break her focus and get her attention back on us. By asking her to "look at me" I am redirecting her attention through an already established command and asking her to ignore the small animal. When your dog successfully ignores their trigger or is calm around their trigger it is then a good time to reward them with a high value reward their favorite treat or toy. Does this mean I am 100% against correcting? No, I believe that it has it's time and place but should not be your first answer when training. Positive reinforcements permanently change your dog's mentality towards a situation, it sticks in their brain better and lasts much longer than negative reinforcers and their is a lot of research to support this stance. By fostering the kitten we've had a solid month to work with Ziva on her prey drive, at first it was really hard for her. But you just have to be patient. We sent her away when she became too stimulated as a safety precaution for the kitten, and worked to keep all interactions positive for Ziva. We didn't want her to associate the kitten with pain, fear, or being in trouble. Through lots of interaction & patience we succeeded in desensitizing Ziva towards the kitten. Asking her to lay down and remain calm next to the kitten. Allowing the kitten to climb on Ziva while asking Ziva to remain calm and still - rewarding her good behavior. Allowing Ziva to sniff and be around the kitten - Rewarding positive interactions and sending her away when she became to aroused. 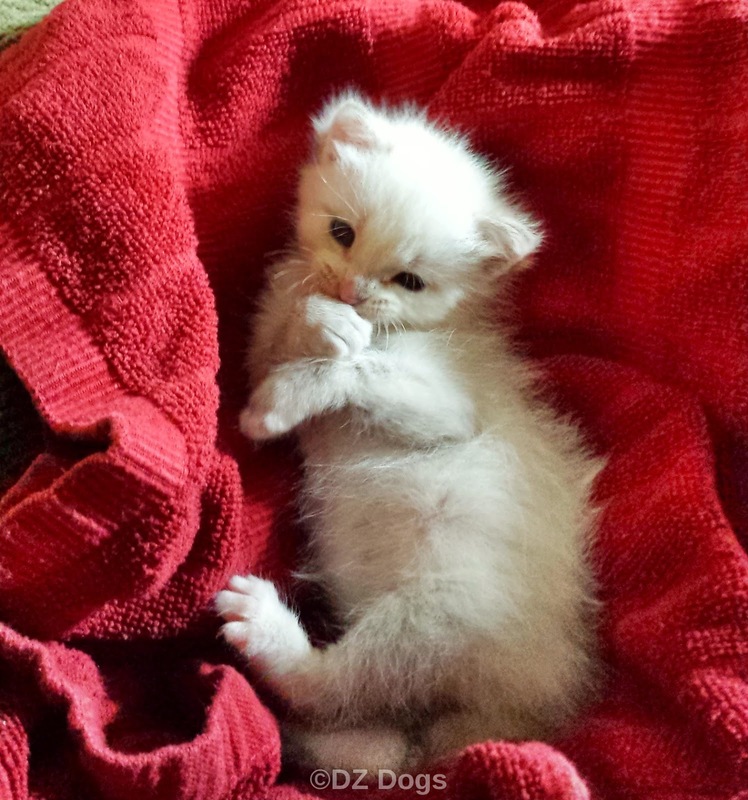 We want her to associate the kitten with positive rewards rather than punishment when she displays good behavior. We don't want her to fear the kitten. We could only progress as fast as Ziva was learning. By taking our time with her, she was slowly able to handle longer sessions of being around the kitten. Remember dogs are social animals, she wanted to be around us so we used that as a reward. She could be around us only if - she was displaying calm behaviors. Negative behaviors resulted in her being sent away. For increasing your dogs threshold you want to find where they can be in proximity to the trigger and still succeed. If your dog is capable of laying on their bed on the other end of the house, watching you interact with the trigger then that is a good place to start. Then move them closer...one step at a time. If you reach a point where your dog is no longer capable of ignoring the trigger then you have reached their threshold - back up until your dog is once again successful and work from their. If you have a puppy you can more easily train them to ignore small animals by beginning training early, rewarding good behavior and sending your dog away to calm down when they display unwanted behavior. Squeaky toys should be avoided, as they encourage prey drive. Your cute dog is not playing by destroying the squeaky toy, they are killing an animal in their mind. This is not a game you want to encourage. You can also see that Ziva has no resource guarding issues, something that Tex-Anna struggled with but were able to work her through. 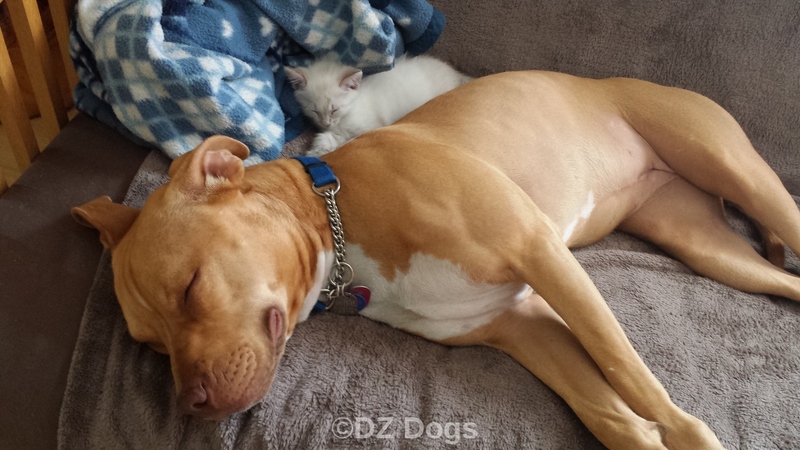 For Part II of Ziva and the kitten - Guardian of the Kitten, click HERE.